We all wondered when it would happen. When would Hope Egan and Chef Michelle Donaldson give Downtown Tulsa lunch? The Tallgrass Family has been (understandably) occupied this year mastering dinner at this “Farm to Tulsans” concept, and we have eagerly waited to see how they would tackle lunch in the Blue Dome District. The bottom line is that Tallgrass has delivered just like you knew they would. 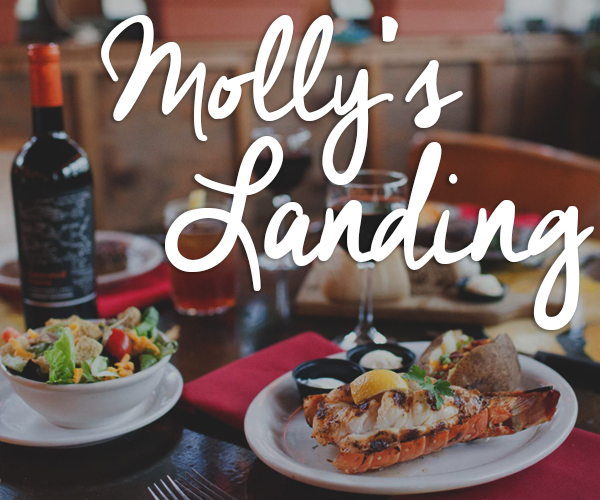 Currently they offer 5 small plates, 5 salads, 5 sandwiches, and 4 large plates. So far I have tried 6 of those dishes and plan to eat my way through the rest of the menu this summer. I am going to first highlight my favorite dish so far and what I predict will become their most popular lunch dish. It is the Pastrami on Antoinette’s Rye Baguette ($12). Let’s start with the meat: The house smoked pastrami is as tender and flavorful as you will find anywhere in town. Next, the bread. Antoinette’s Bakery makes these baguettes fresh for Tallgrass daily then Chef Michelle toasts it on the wood fire grill right before serving it to you. It’s perfect. There’s sautéed cabbage, which you would expect, but you might not expect the combination of a horseradish creme fraiche, Lomah havarti cheese and giardiniera relish. 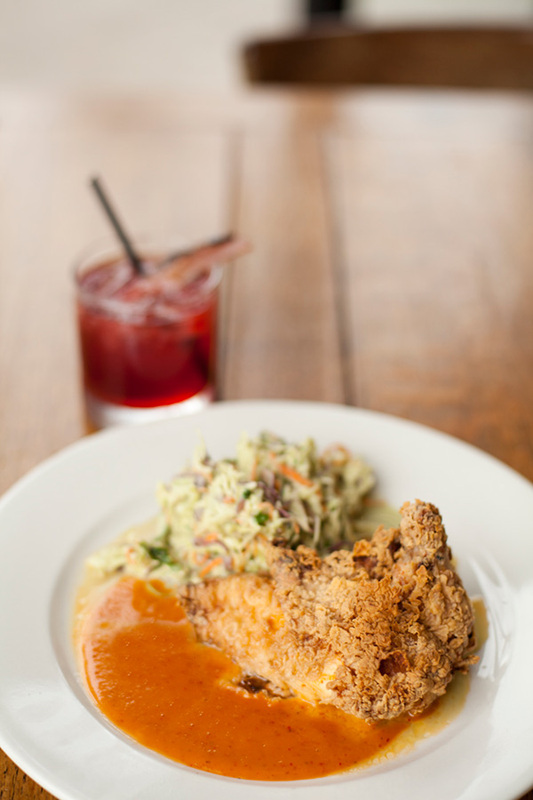 With all these elements in play this work of art lands as one of Tulsa’s top unique and delicious lunch options. Of course, when Chef Michelle Donaldson and Chef Mark Pride put themselves to the task of creating a badass burger is easy to get excited about it. 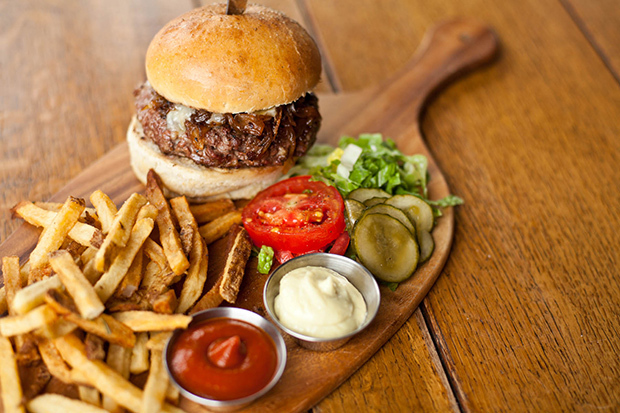 They played with various combinations of house ground beef before landing on this short rib + brisket burger. It’s an event in itself. As great as the patty is, I must say that the potato bun really makes this burger for me. It’s baked in house and is a Hope Egan creation. It holds up like a champ against the medium rare juices of this bad boy. The bun is spread with bourbon mustard and the patty is topped with cheddar and caramelized onions and housemade pickles. Oh – and don’t forget their house-cured and smoked thick cut bacon. Joe Price? Eat your heart out sir. Next, our table tried the BLT Panini ($12). 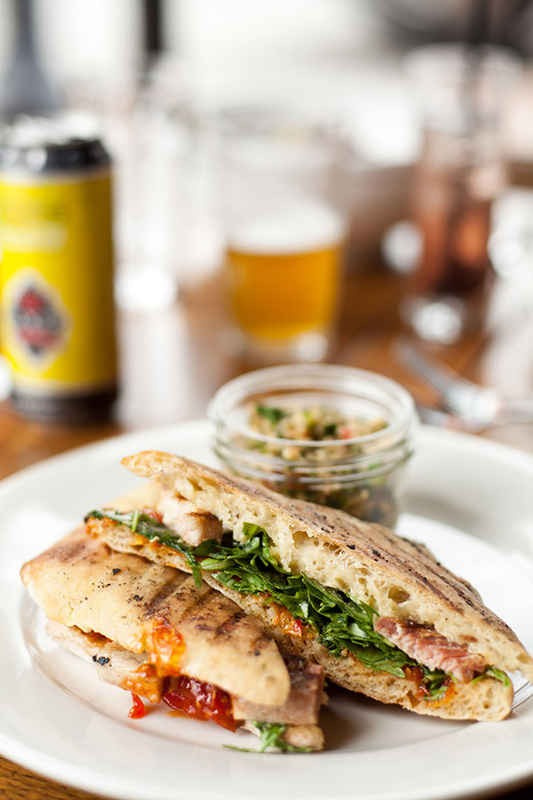 It’s built with house smoked pork belly and arugula on ciabatta. 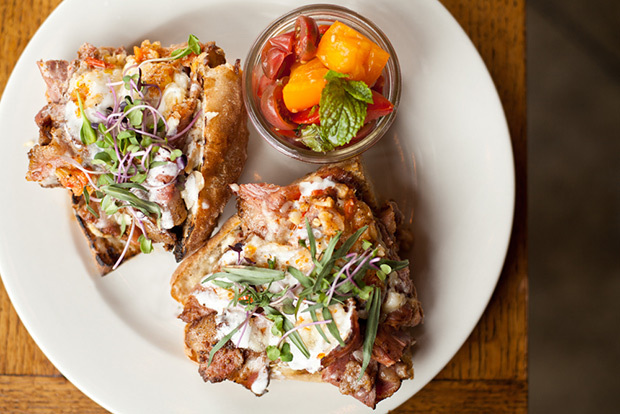 The excellent thing about this dish is the sweet hot tomato jam, making this a great play on the traditional BLT. Next, we ordered the spicy hot fried chicken ($15). A slightly larger portion of this is available at dinner, but we knew how good it is and just had to have it. Chef Michelle makes a panang curry gravy that is tempered with a cold side of lime leaf cole slaw. Finally, we ordered salads. I know – it’s a meal out of order, but I didn’t want to leave until we had tried what Chef Michelle says is her favorite dish on the menu, the grilled Akaushi steak salad. And I had heard stories about the blackberries in the the house smoked chicken blackberry salad so we decided to have salad for dessert. 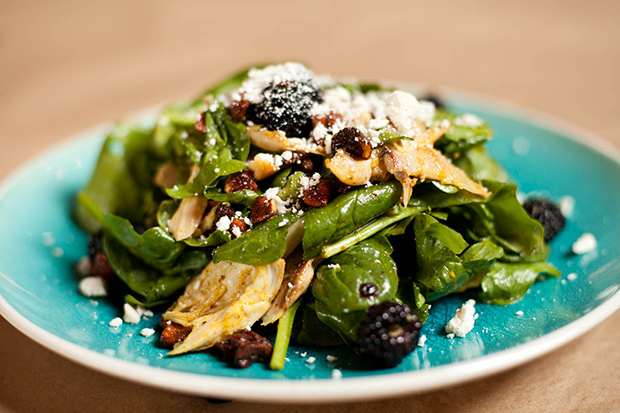 The smoked chicken salad is a refreshing combination of spinach, myzithra, honey-cayenne cashews and of course the fresh organic blueberries topped with a sweet and savory apple cider vinaigrette. The steak salad is set up with arugula, roasted sunchokes, and aged gouda that are all tossed in a spicy buttermilk and Boursin dressing. 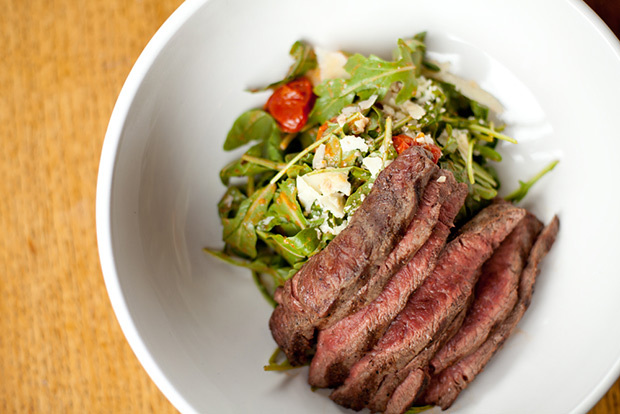 The main note on the steak salad is that the price point is an excellent value for this level of beef, and Chef Michelle does not hold back on the portion. Akaushi beef is deliciously marbled and very tender. And when you try it you will agree that $14 for this salad is a steal. What a lunch. The pastrami still wins my heart, but I’ll be back soon to try the grilled yellow tomato gazpacho and the black truffle farm egg salad sandwich soon to see where they stack up.